A weathered old northern red oak (Quercus rubra) is home to many species of birds and other animals. A tree’s beauty is easily noticed in three seasons: Spring’s first green haze of buds; summer’s rustling crown of leaves; and autumn’s smoldering colors. Winter uncovers a different kind of beauty: that of bark, interesting shapes, animal shelters and open sky — the guts of things not often seen. A small stand of northern red oak, at our cabin along the Snake River in Pine County, MN, includes a tree that was sheared off in a summer windstorm two decades ago. 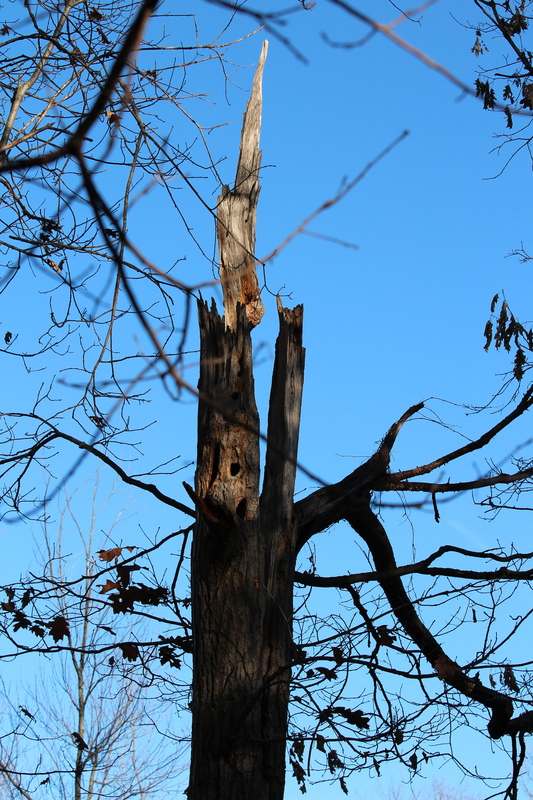 Neighboring branches hide the jagged top most of the year, but in winter the scarred wood’s polished grain and shape are revealed, along with hidden nesting cavities. Squirrels, great-created flycatchers, red-bellied woodpeckers and most recently, pileated woodpeckers have nested and raised their young in this red oak. 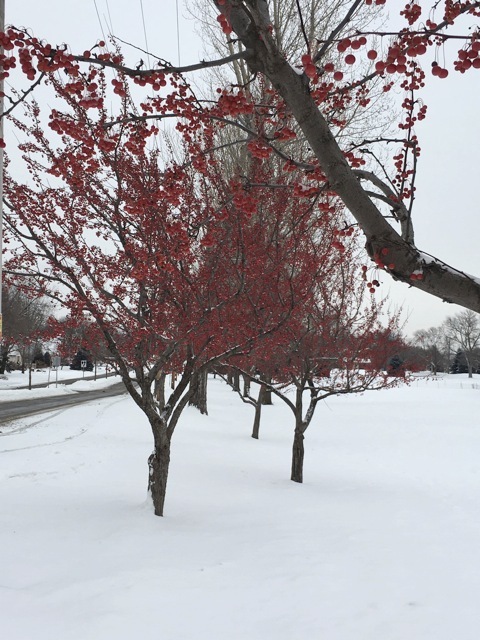 Crabapple trees (Malus) provide food for many birds and add winter color. Crabapple trees, especially those with long-lasting fruit, add warm crimson to the stark black and white landscape. Their small shapes and curving branches remind me of bonsai trees. By late spring, most of the plump fruit will be consumed by cedar waxwings and robins. 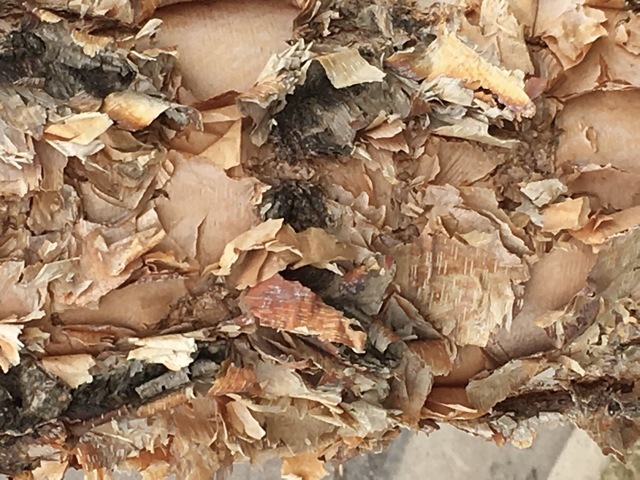 The bark of river birch (Betula nigra) is multicolored and has a shredded texture. Bark patterns and colors are more pronounced in winter with fewer distractions from the rest of the plant world. One of my favorites is the papery bark of the river birch. The colors range from soft brown to salmon, pink and ivory. The bark shreds and flutters in the wind. Paper birch bark (Betula papyrifera) is pretty too, especially at sunrise and sunset when low rays add blush to the tips of twigs and branches. White spruce (Picea glauca) and other evergreens shelter many creatures. 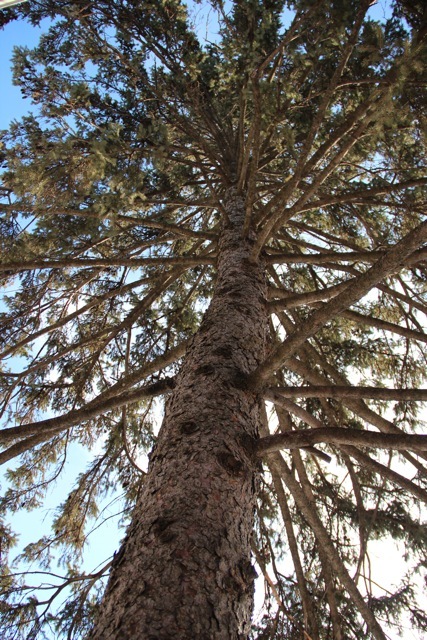 The white spruce has grayish-red bark with a rough mosaic-like texture. Its evergreen branches shelter cardinals, kinglets, juncos and chickadees. 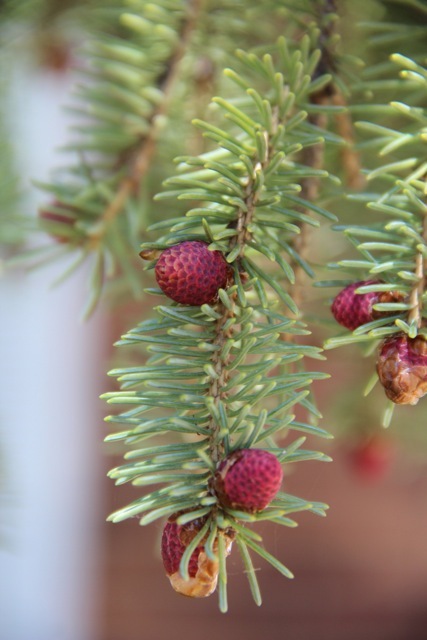 At the end of winter, new burgundy cones appear, like tiny ornaments, on the tips of branches. New cones form on a white spruce. Winter trees reveal the hidden face of nature — textures, hues, patterns weathered and worn — and more open sky to view the moon, stars and urban sunsets; beauty to the eye that looks carefully. What do you see? 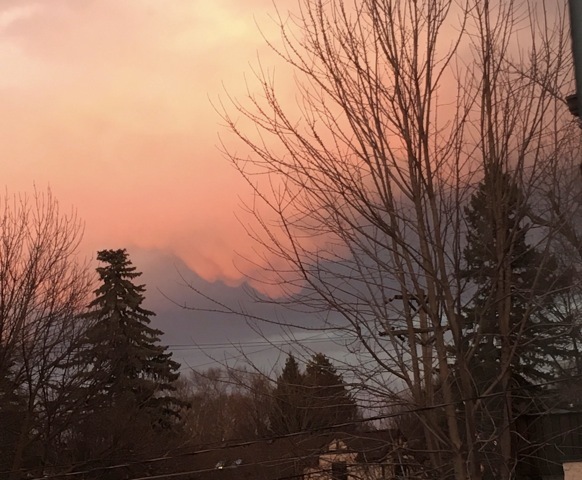 Winter sunset over Saint Paul, MN, on Feb. 22, 2017. 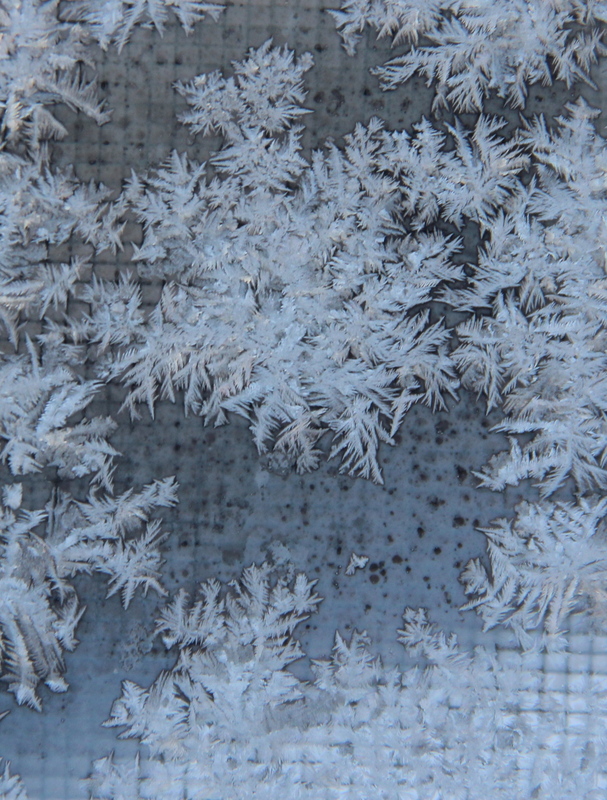 Crystalline flowers flow across the storm windows in our north-facing bathroom. 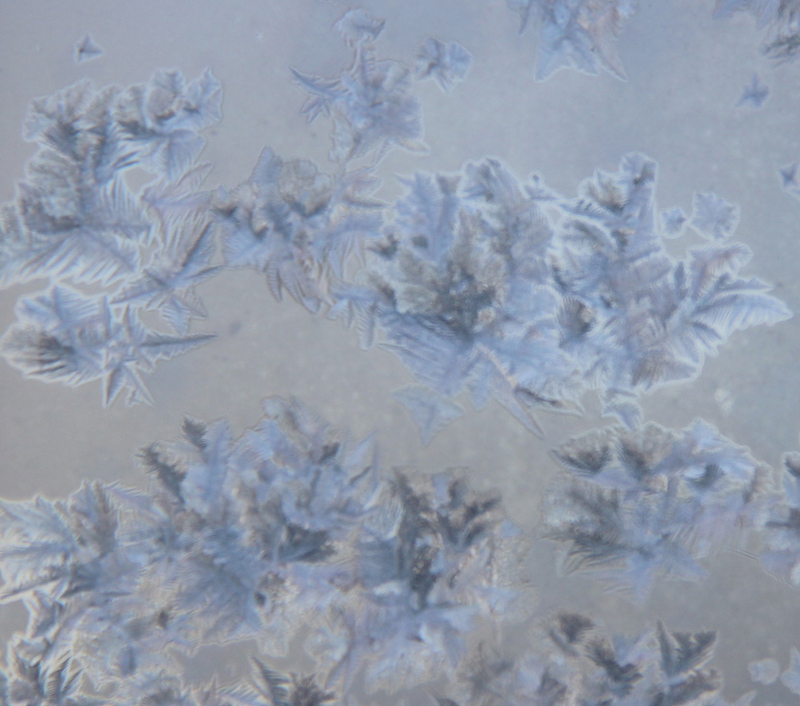 In this subzero weather, the moisture from our steamy morning showers seeps through the old, loose-fitting decorative windows and condenses as frost on the cold glass panes that cover the screens. 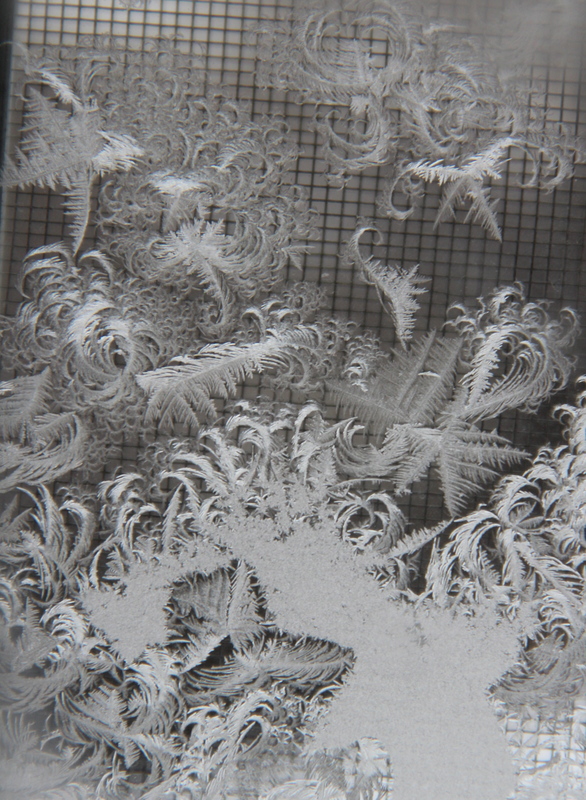 The patterns that take shape depend on the amount of dirt, scratches and residue on the glass, and the humidity level and temperature of the air. 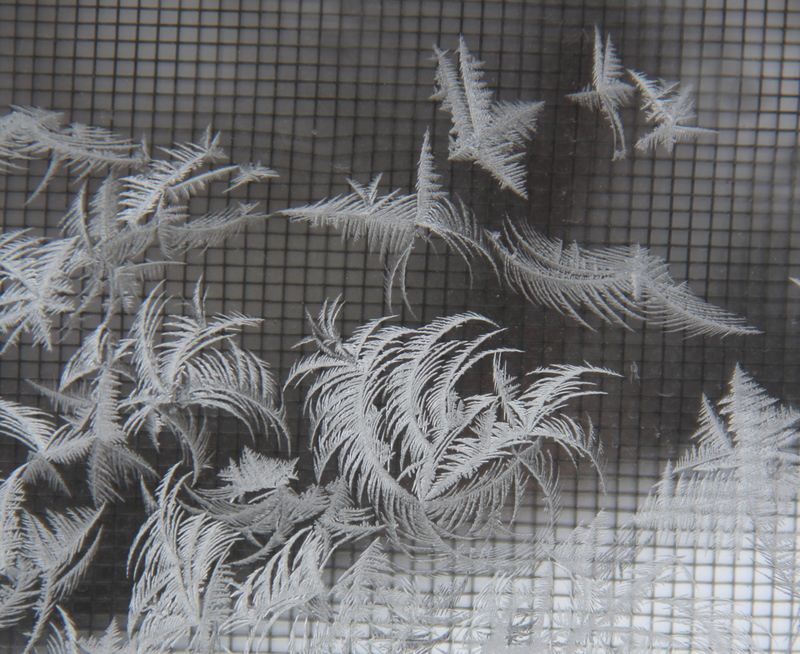 These patterns are often called frost flowers, roses or ferns. 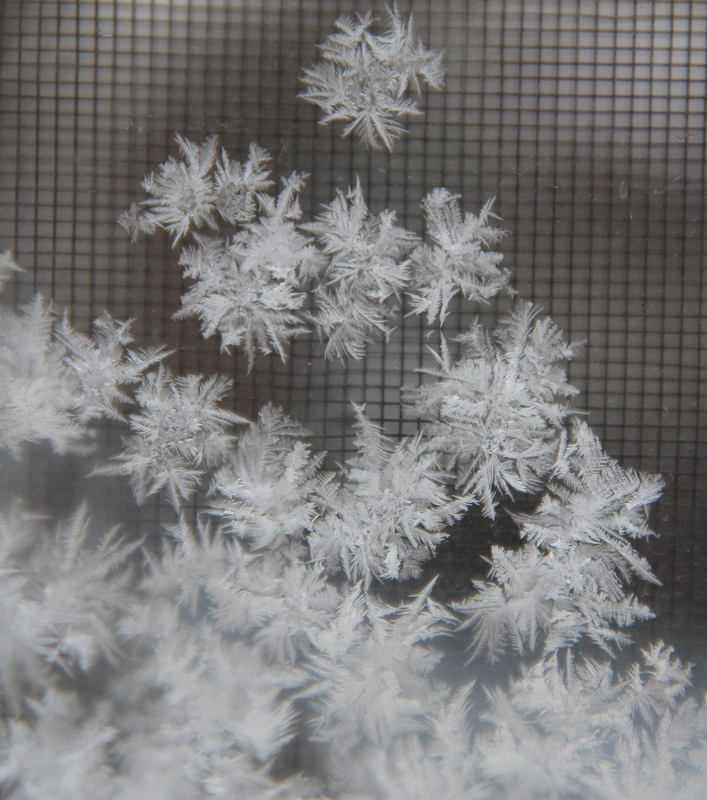 According to Halldor Svavarsson at the Icelandic Web of Science the most commonly formed pattern of crystallization is hexagonal because it requires the least amount of energy. If the moisture settles and freezes quickly, the roses will be small and close together. If not, the roses may be fewer in number, larger in size and may spread out on the glass. 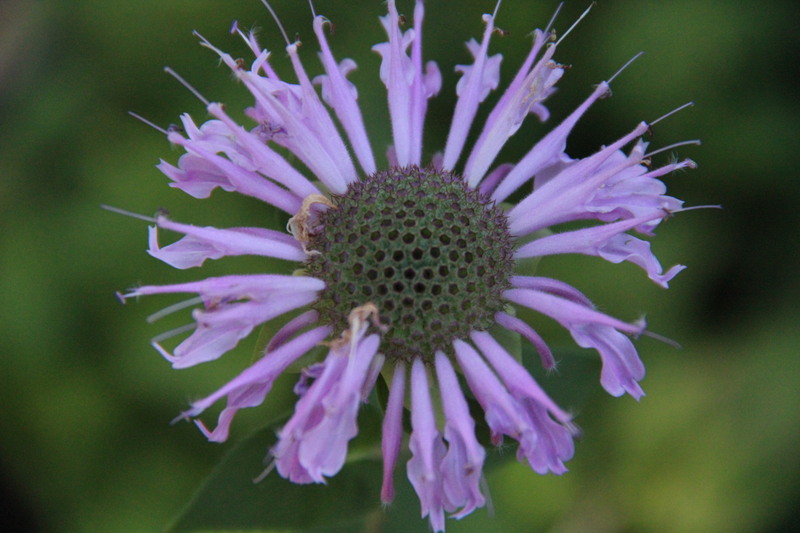 Fragrant, spicy wild bergamot or bee balm (Monarda fistulosa). 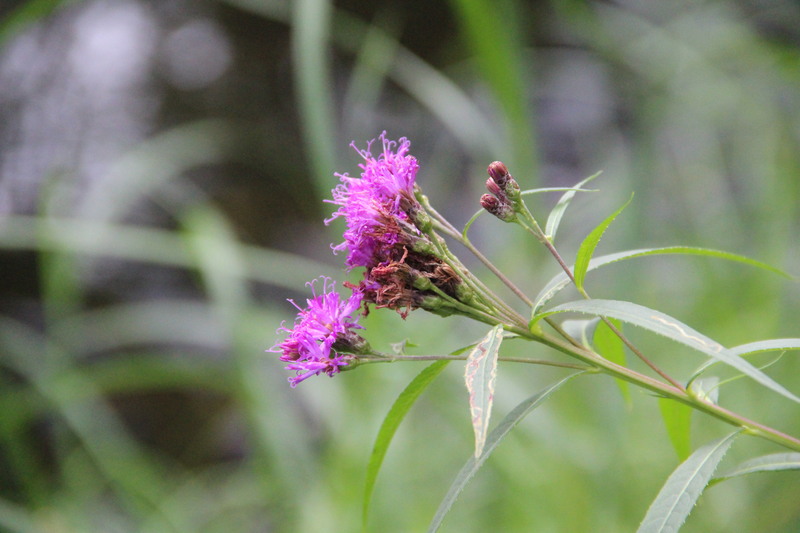 Prairie or smooth ironweed (Vernonia fasciculata). 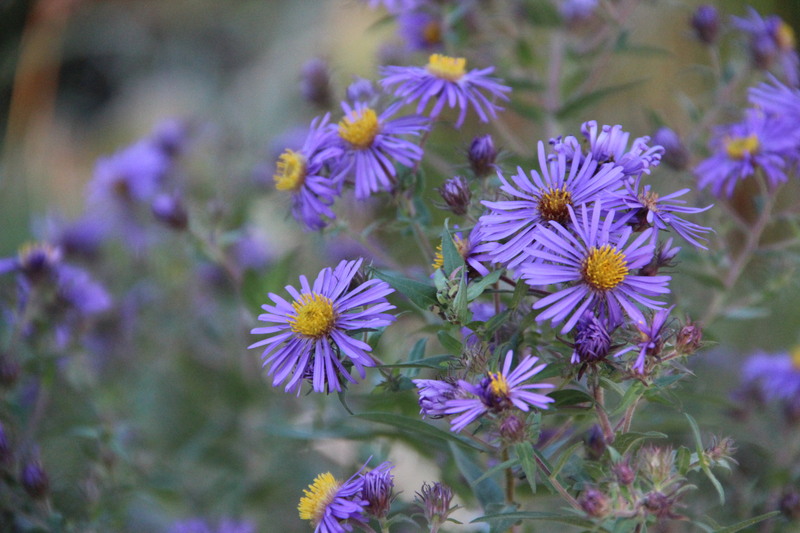 New England aster or Michaelmas Daisy (Symphyotrichum novae-angliae). 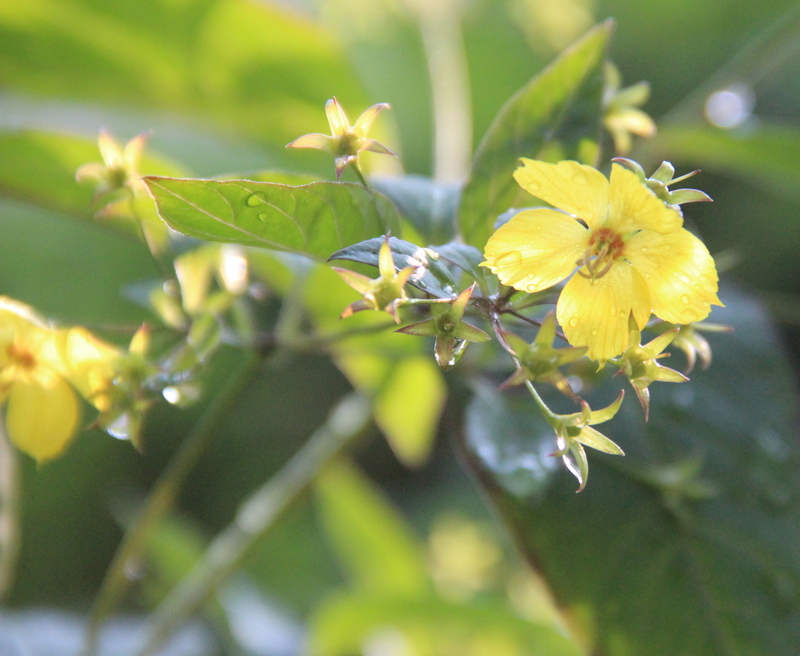 Native fringed loosestrife (Lysimachia ciliata) is unrelated to the non-native, invasive purple loosestrife. It started out as rain, then many hours of mist. Later, heavy wet snow changed to sleet and back again, weighing down and soaking seed heads, decorative grass and the few leaves that haven’t fallen from the trees. This snow is likely to stay for the rest of the winter, given the subzero temperatures and the prediction of more snow to arrive on Sunday. I’m not a winter person, I’m a summer gal. I miss the melodious birdsong, the activity of butterflies, bees and colorful beetles in our garden, the leafed-out trees, the warmth of the sun and the long, long hours of northern daylight. But I try to find the raw, stark beauty revealed in the winter months. It is not the vivid, vital beauty of summer. No, it is a harsh beauty that complements the cold, brittle air, stinging wind and sharp light of December. 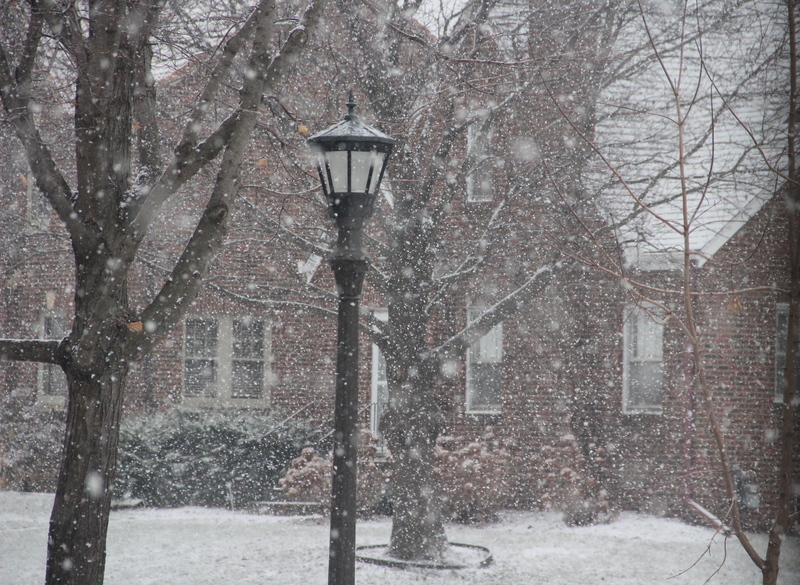 The season’s first “sticking” snow is likely to remain until spring. When snow falls, a temporary hush settles over the city, dampening the noise of traffic and aircraft, and making it easier to hear nature’s sounds — the quiet ticking of sleet and snowflake on spent plant stalks, the rustle and crackle of brittle leaves in the wind, a chickadee’s call and the honking of geese flying low overhead. 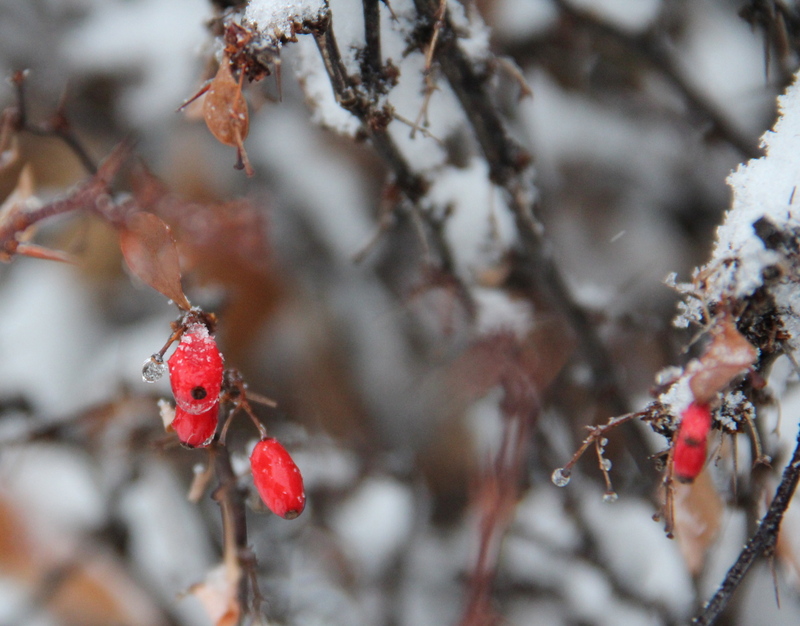 Red leaf barberry (Berberis thunbergii ‘atropurpurea’) fruit is encased in freezing rain. 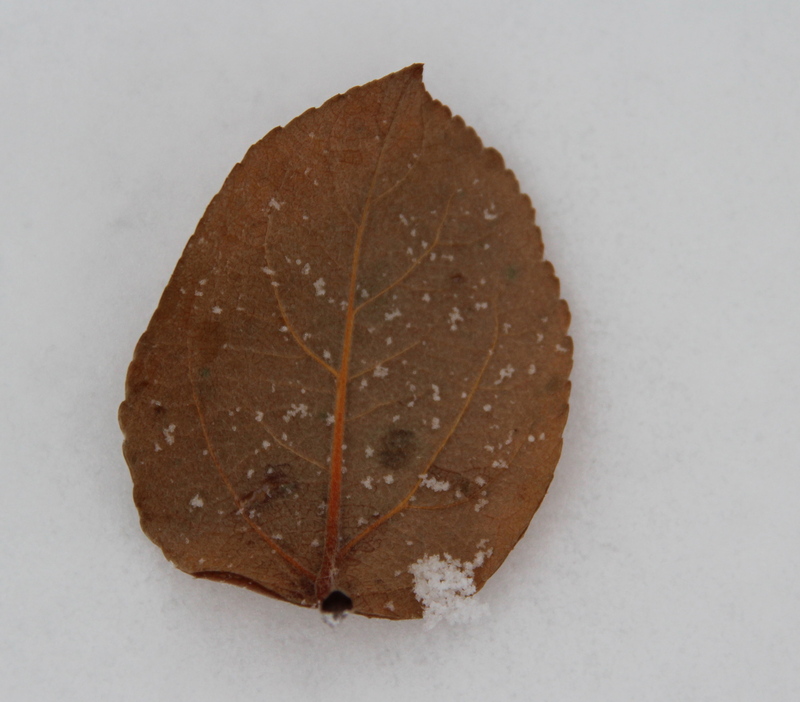 A single beacon apple (Malus ‘beacon’) leaf decorates a snowy landscape. 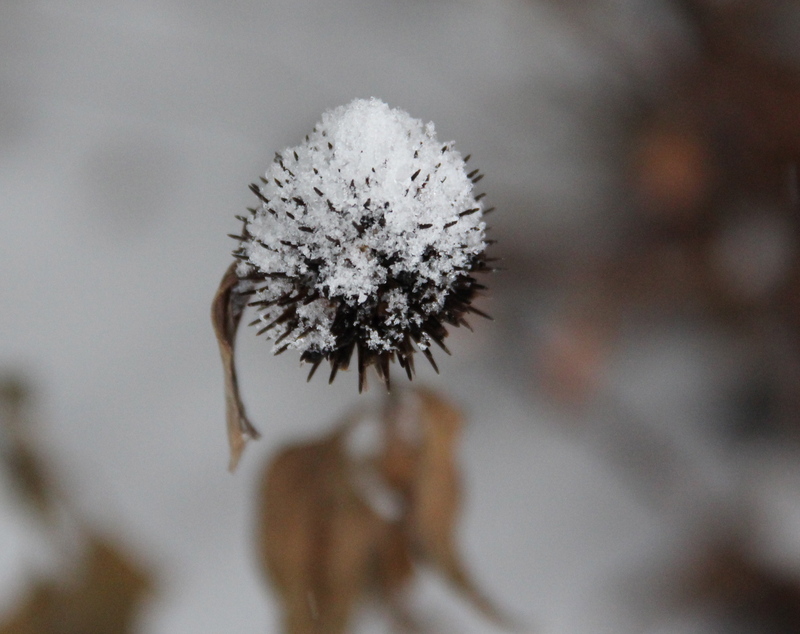 A purple coneflower (Echinacea purpurea) seed head sparkles with beads of sleet. 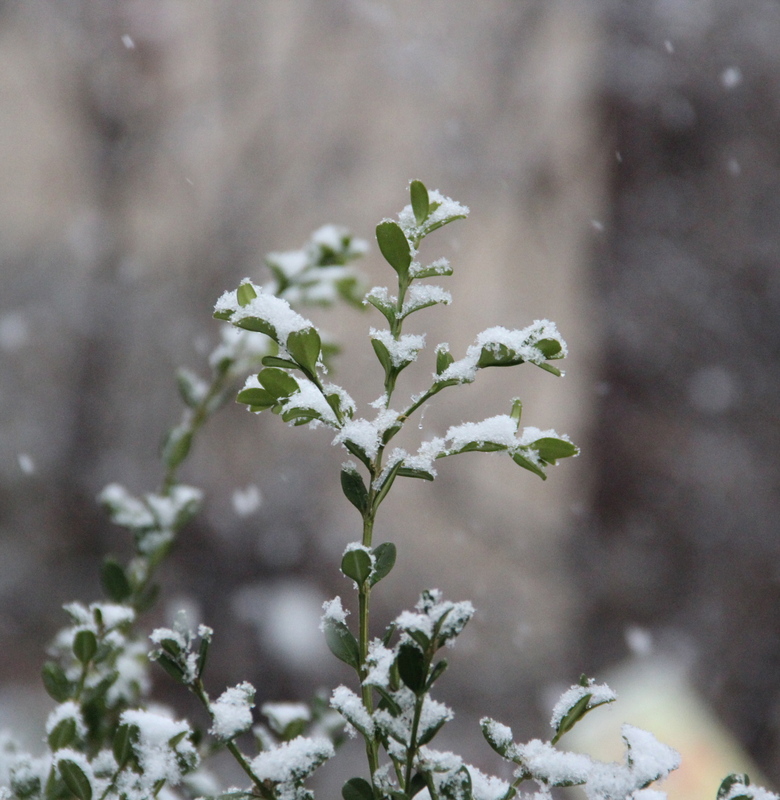 Snow frosts the tips of an evergreen Korean boxwood bush (Buxus microphylla var. koreana). 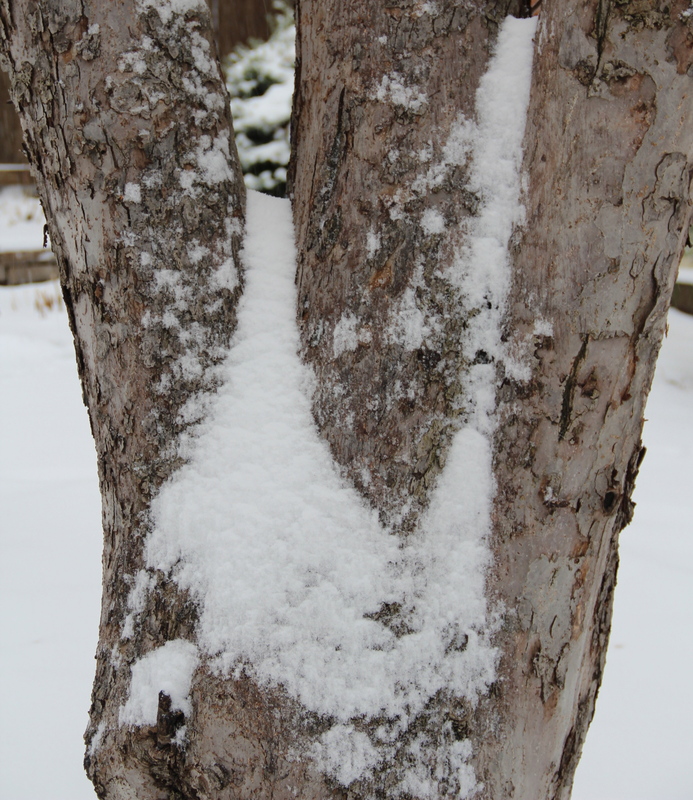 Snow softens the rough, scaly bark of a 60-year-old beacon apple tree (Malus ‘beacon’). 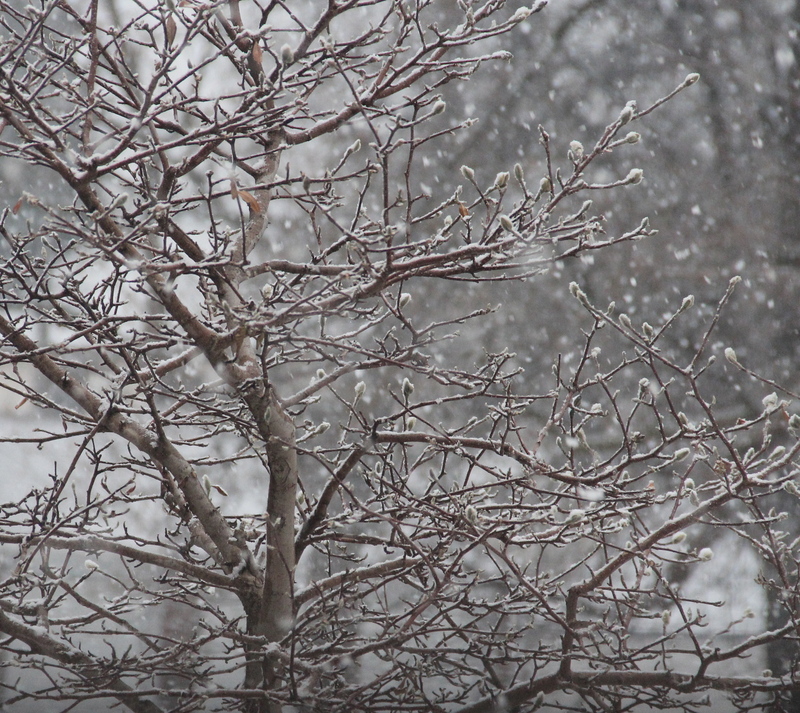 Tightly closed Star magnolia (Magnolia stellata) buds are dusted with falling snow.